LO'JO, the mighty French musical pioneers from Angers, present their new album "Fonetiq Flowers"
There are times when we half-listen to an old friend natter, convinced we can predict what they’ll say next. There are times when we buy the latest book by a famous author, with no intention of actually reading it, simply because their prose shook us in our youth. How easily we forget that people change, progress, and rebel. We forget that life is often only a succession of rebirths. FONETIQ FLOWERS reminds us that life is in constant flux, as LO'JO seem born anew. After recording more than fifteen albums since the beginning of the 80s, performing hundreds of gigs on all continents, collaborating with a wide variety of prestigious artists (Robert Plant, Tinariwen, Robert Wyatt, Archie Shepp...) and thereby creating an unquestionable aura, the band from Angers, in the West of France, are now rewriting their own history. Well, almost. Denis Péan’s distinctive orchestral arrangements can still be heard here and there, but a fresh breath is palpable throughout these thirteen songs, recorded around the world, from Austin to Lafayette, Seoul to Tbilisi, from Cotonou to Paris and Bamako. 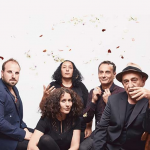 Paradoxically, it may be their least “multicultural” album to date, despite the presence of instruments as diverse and exotic as a Korean kayagum, a Georgian panduri, an Iranian daf, a rik and an oud, it is also undoubtedly the most electro-acoustic oriented in their discography. This could be because the band invited the versatile French singer and musician Albin de La Simone to add a kaleidoscope of musical colour with his prismatic keyboards, or, perhaps simply because LO’JO have dared to bust the dam which contained their reservoir of new sonic desires. Who for example would have thought they would hear a duet with the rapper from the Swiss band Puts Marie (« Noisy Flower »). FONETIQ FLOWERS feels like the first day of the rest of their lives, with new, endless possibilities opening before them. Dance a topsy-turvy waltz to the rhythm of a children’s choir (« Chabalaï »), rekindle the romances of your youth with« Fonetiq », hold your breath for the remarkable « J'Allais », scream at the top of your lungs « I will give you a wish », sing with the sisters Nid El Mourid (« Tu Neiges »), plumb the depths of your soul while clinging to the sound of Erik Truffaz’s trumpet (« Stranjer Than Stranjer »), switch off the lights for the deeply moving instrumental, « Figurine », a finale which a Fred Frith or Brian Eno would not have disowned. Like Tom Waits or Nick Cave, LO'JO refuse to follow the pack, instead taking the roads less travelled, the paths that lead them from one life to the next, without ever waning.